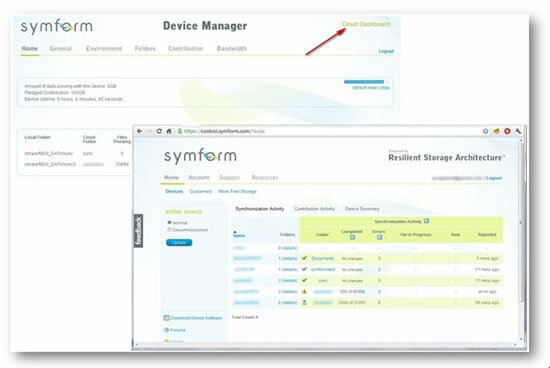 A Symform™ device automatically mirrors files to the Symform Storage Cloud™. These files may be a user’s documents, pictures, videos, etc. on their laptop or desktop or they may be local backup archives or images from various PCs and servers running business critical applications. 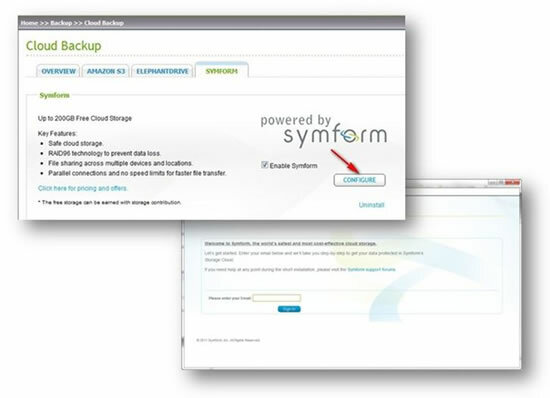 In the event of a disaster, Symform enables an automatic restore of those backups by mirroring the files back locally to any replacement computer. Files may also be “shared” across computers for scenarios such as creating a regional instant restore (hot standby) for backups for fast restore in the event of a disaster or simply to enable collaboration between users or corporate sites by sharing files. This document provides an introduction to Symform Storage Cloud. 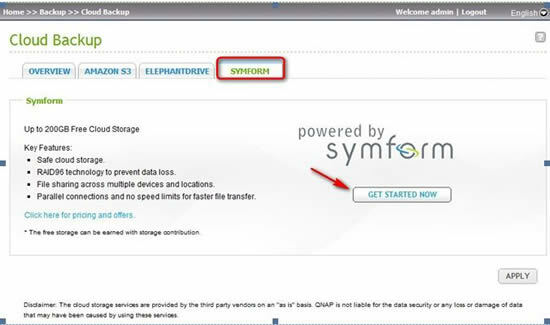 About the step-by-step description of installing, configuring, and troubleshooting the Symform software running on QNAP NAS, please refer to http://www.symform.com/user-guide-qnap. For more information on the technical architecture, please refer to this website: Symform Frequently Asked Questions (http://symform.com/faq.aspx). 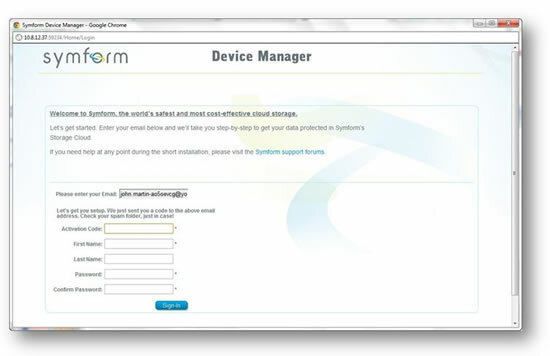 You can also visit the Symform Support Forums (https://control.symform.com/forums/) for the solutions of certain technical issues. Select the folder to back up or synchronize to the cloud. It can be an existing or a new folder. To restore or synchronize the data from the cloud to the NAS, please create a new shared folder that will be used to restore the data. To set up contribution, create a new empty shared folder. The folder will be used to store the contribution data. Login the NAS as an administrator. Go to “Backup > Cloud Backup > Symform”. Click “Get Started Now” to install Symform. The NAS will download Symform, verify the package and install it automatically. Please wait for the installation to complete. Click “Configure”. A window will appear for the configuration. Enter your email address to activate Symform on the NAS. An activation code will be sent to this address. Check your email to get the activation code and finish the setup. Follow the steps to configure Symform. When done, the folders chosen during the setup will be backed up to Symform Storage Cloud. 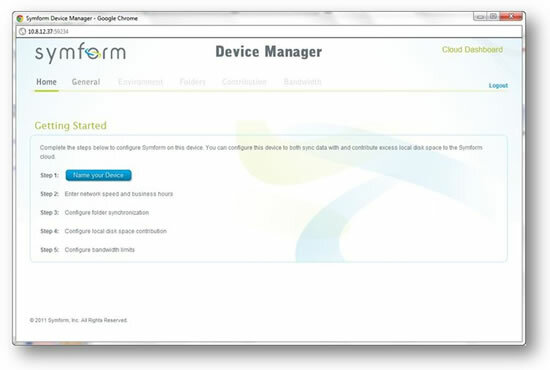 After Symform is activated, you will be able to see the device configuration. Click “Cloud Dashboard” to have access to Symform Cloud Dashboard and check the status of all the devices that are running Symform Storage Cloud. Contribution TCP port: Defined randomly during Symform setup and can be changed if necessary. All TCP outbound ports are mandatory. Symform with contribution requires network bandwidth. If contribution is enabled, there will always be communication between the NAS and Symform Cloud. This may cause network utilization and the bandwidth can be limited as needed.